Translation:Are you having a party? Took me too long to figure out what their tagline meant (Har något andra inte har). Something along the lines of "have something others don't"? You're absolutely right! Have a lingot. Yeah I think that's it exactly. And hello, we're learning the same languages! What does Eller mean in this sentence? "Are you having a party or?" ? Yes, it's sometimes inserted to the end of a question, quite colloquially. I suppose it makes the question sort of demand an answer. Examples: Har ni fest eller? Kommer de eller? Händer det något eller? So r + n makes a special sound here, I can hear the difference from a normal n clearly. It's often hard to hear a new language correctly, it gets much easier with practice. The same is the case with the a sound in har. Swedish has more different vowel sounds than English which makes it difficult to pick out the differences at first. The sound is actually not bad here, but try to listen to native speakers as much as you can too. http://sv.forvo.com/search-sv/ is a good site for pronunciation of words. Thanks. I'm already using Forvo and it's very good, indeed. As for listening to native speakers... It's a problem.. I wouldn't understand anything. I wouldn't even recognize any word that I already know, I'm sure about that. I have a podcast app on my phone and I tried once to listen to some Swedish and of course I couldn't understand anything. The way they speak is EXTREMELY COOL and all the language sounds sooo extra-cool and nice but without understanding anything... yeah.... And as for practising what I've learned here, again there's a problem... I cannot practise it anywhere. If I'm trying to have a monologue with myself it wouldn't work.. I could ask myself "Vad heter du?" etc and continue with easy stuff but still not much to say... And another problem learning Swedish is the small amount of people speaking it..When I search for example "ett äpple" on google to see if it's actually "ett" or "en" I can't get anything. This was a easy example but there are more complicated ones. However, when I search in English for example "unfortunateli" google would correct my error and write "unfortunately", whether in swedish that's not possible :(. I think for genders, Wiktionary is pretty reliable, for other lexical resources I've made a list here https://www.duolingo.com/comment/5723209 but many of them are more useful for advanced learners. (btw SAOL, on top of that list, has genders for everything and is 100% correct) But I think if you just keep working through this course and listen to the speaker you'll automatically get much better at distinguishing the sounds. So just don't give up! I've heard that one, I laughed so hard! Bit NSFW though. 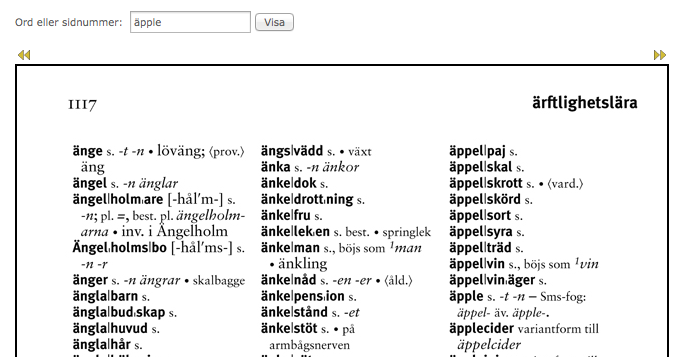 then on äpple it says -t, -n which tells you that the determinate form is äpplet and the plural is äpplen, which in turn tells you it's an ett word. – But, don't worry, if you keep using the course, you'll learn anyway. The course covers pretty much everything in Swedish grammar, like all verb tenses, but Duo isn't enough for fluency in any language… but I think it's a good start, I use it myself for several languages as you can see :) once you get that start, it's so much easier to continue. So good luck! And ask questions in the forums when you have problems, there are a lot of friendly and helpful users here. I will keep using this course, of course but I don't really know if the course has "all the stuff" needed to speak/comprehend Swedish very good... I mean, there isn't just the present tense in Swedish, that's for sure..I'm "scared" that duolingo won't have the other tenses (past,future etc) , so it won't be possible for me to speak fluently because there is NO "Learn Swedish without a teacher" in my language( I'm not an English native speaker ). I could buy a dictionary ( the only one :| ) for my language-Swedish but I already have an English-Swedish dictionary on my phone and there's SAOL too now... So the conclusion: if Duolingo doesn't "learn" me all of the stuff really needed to start talking and comprehending very well, I'm dead because there's no place I can learn Swedish from my language..
Well, yes, there may be nice people but there is no forum for Swedish.. And by the way, how can I become a moderator ? I could teach my language on Duolingo...There is already a course in building but there's no option to help moderating the course.. I meant the sentence forums, like the one we're in now. Yea, well I always check out these forums :). My native language is Romanian. Ah! I'd really like to learn that. They seem to be 7 people already which is quite a lot. But sometimes courses need more moderators when they go into beta, or even after that. I'll definitely take that course when it comes out. You know, it great to learn languages when you're doing it for fun because you don't pretty much care at all of how many speakers that respective language has, or how much is spoken worldwide. Swedish has 9 million native speakers I guess. That's incredibily small but I don't care at all. I want to learn it so bad because I think it's very cool and because my "hobby" is to learn languages and I want to become a polyglot one day. Same with you( I guess ). Romanian doesn't really have more than 25 million native speakers, I assure you that. Again, that's a small number and you wouldn't have any purpose to learn it because our economy is very poor and the salaries are very small but again: you're a polyglot and you want to learn it for fun ( just like me with Swedish ). Tell me if that's not the case with you because I don't think you're planning on coming to Romania and start working here :)). Of course, the culture is great and we have great mountains and landscapes, but that's another story :). I've just remembered something important to ask you :). I have a problem of choosing some more languages to learn. I mean, I want to learn Swedish but at the same time I want to learn another language too( Italian ). I see that you're 22 in German, 21 Italian, 20 English etc etc. Do you really speak all of them with intermediate proficiency( or maybe fluent or MAYBE even native level ) ? What would you recommend ? I was thinking the last 3-4 days to go to my local store and buy a Grammar book of Italian and a dictionary( Romanian-Italian/Italian-Romanian 2 in 1) and start learning it in parallel with Swedish... I tried to do that with German and Russian in the summer and it didn't end pretty well. I was studying German for nearly 3 months already and I was proud of myself at that time ( over 1500 words learned with my 'strategy'-that wasn't pretty intelligent->just writing down the words and their translation and repeat them every day for 9 days by covering the translation then the words in the target language and see if I learned them). Then, by the end of August I wanted to start learning Russian ( I already learned the cyrillic alphabet through the internet). Since it doesn't exist a dictionary or course or anything for russian in my language(really, I'm serious) I bought The New Penguin Russian Course and an Oxford dictionary English-Russian and vice versa and yeah... It didn't end too well with Russian( or German for that matter because school started and I had a LOT of work and yeah...). Now, as I said, I'm afraid to get Italian in parallel with Swedish. If I'd start learning Italian I don't know how to do it. With the help of duolingo or with my Grammar Book and dictionary ? Why isn't there an article? ”Ha fest” is sort of a semi-fixed expression, and then the article is often omitted. Compare ”spela piano” (play the piano), ”plocka svamp” (pick mushrooms), ”skriva brev” (write a letter), ”bygga hus” (build a house) etc. I am going to add that this happens when you speak generically. In Swedish, if you say ”ha fest” you’re not referring to any party in particular; it’s almost part of the verb. If you say ”ha en fest” then you’re speaking generically anymore and you’re narrowing it down to one party. Usually you rely on "ett" to determine if brev is singular or plural. How would you in "skriva brev"? Would you just need to include an adjective like "flera"? Sure they do, it's a perfectly common construction and if it's an euphemism for something, it's not one I know. "Plocka svamp" and "plockar svamp" are the same thing though, it's just that one is the infinitive and the other is the present tense. Why is there no indefinite article in the Swedish? Wouldn't it be "Har ni en fest"" for "Are you have a party?"? Please have a look at Lundgren8's comment above. I know that Swedish is a v2 language. Is the verb always first when a question is asked, like in English? Is a båtfest a party cruise? No, not really. I mean, you could party on a boat and then it'd be a båtfest I guess, but it's not a common expression. For going on a cruise ship to party, we'd say that we're going on en kryssning, which could, if you really want, then be specified as a partykryssning or whatever your intended cruise activity is. I thought they were called party cruises? What's wrong with "do you give a party?" ? ?